A mission to remove 4,000 tons of sugar from Australians' diets! 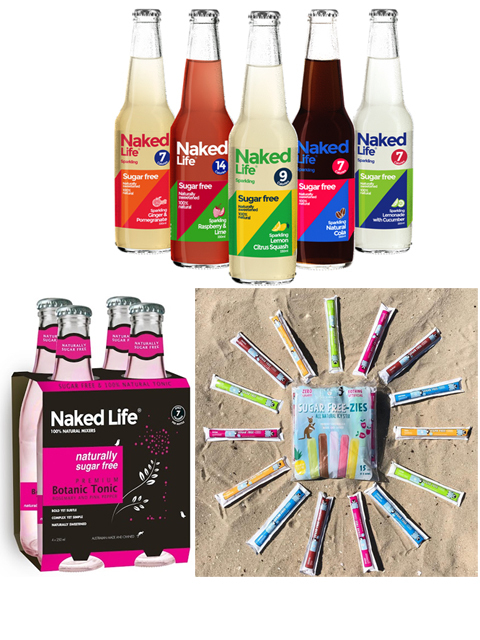 Makers of Australia's first natural sugar-free soft drink, Naked Life Sparkling, have taken their sugar-free movement to Australian children with the launch of The No Nasties Icicle Project. The No Nasties Icicle Project is Australia's first range of 100 per cent natural and sugar-free 'icy stix' for children. "Our mission through the project is to remove 500 tons of sugar from Australian kids diets every year, without them missing out on any fun! We know parents today still want to be able to treat their children, but at the same time are well-educated on the negative effects sugar and artificial preservatives can have on their health. Committed to the cause, The No Nasties Icicle Project has pledged to donate $100 for every one-ton of sugar removed from the category through sales of their SUGAR FREE-ZIES to a selection of not-for-profits driving awareness around better food choices in Australia. A recent study commissioned by SUGAR FREE-ZIES and delivered by ORC International found 70% of Australians surveyed, strongly agree that being free from sugar, artificial preservatives and additives is an important purchasing decision. Despite this, the sugar icy treats category in Australia continues to rise, with leading brands receiving a 21.4% year on year growth without any healthy alternatives in the Australian market until now. "With over 4,000 tons of sugar consumed in Australians diets from water ices last year, it's no surprise one in four children are tackling obesity," says Naked Life and The No Nasties Icicle Project Founder David Andrew. "Everyone has a nostalgic childhood memory of an icy sweet treat on a hot summer's day, so we knew this was the perfect place to start." "I've been overwhelmed with the amount of positive responses from Australian parents since Sugar Free-zies have been in production, it's phenomenal! The first word I hear from everyone's mouth is, finally!" says David. The product has become a cult-favorite/ gone viral with mother's of diabetic children - we've been contacted countless times from canteens across Australia after mums have dropped off our product so their kids finally don't have to miss out. As an Australian first, SUGAR FREE-ZIES will offer five fun flavoured icy stixs to health-conscious parents without the hidden nasties and sugar. Supported and available at Woolworths and all major independent supermarkets nationally.